The Great Smoky Mountains Railroad invites you to share your memories with us! 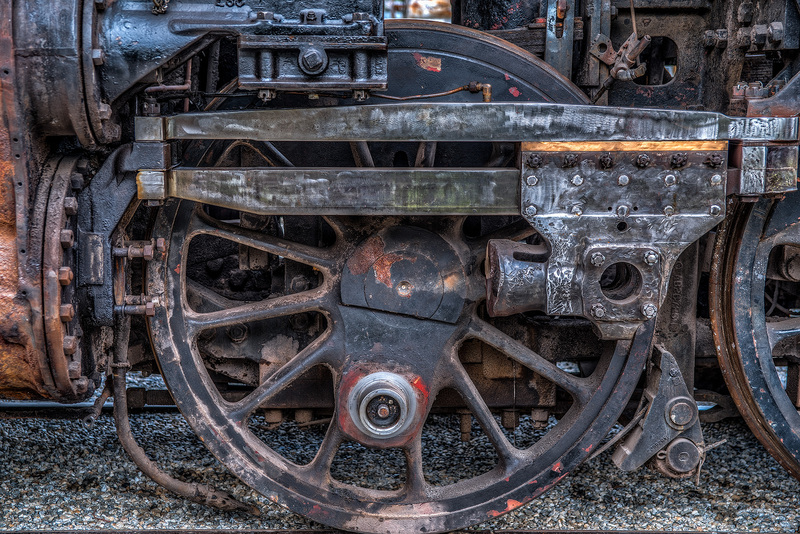 In honor of 1702’s 75th Birthday, GSMR will be creating a “memory board” spotlighting the Steam of the Smokies! We want you to submit your favorite photos and videos of #1702 from any era! When doing so, you will have a chance to see your memories shared on GSMR’s official social media accounts and various other platforms. We are searching for vintage photos from all points in 1702’s history. You may even see your photo featured on our website! Here is a throwback from an Andrews excursion in 2004! We can’t wait to see what you have to share! We have many people ask what happens when 1702 is not operating, here is your answer! 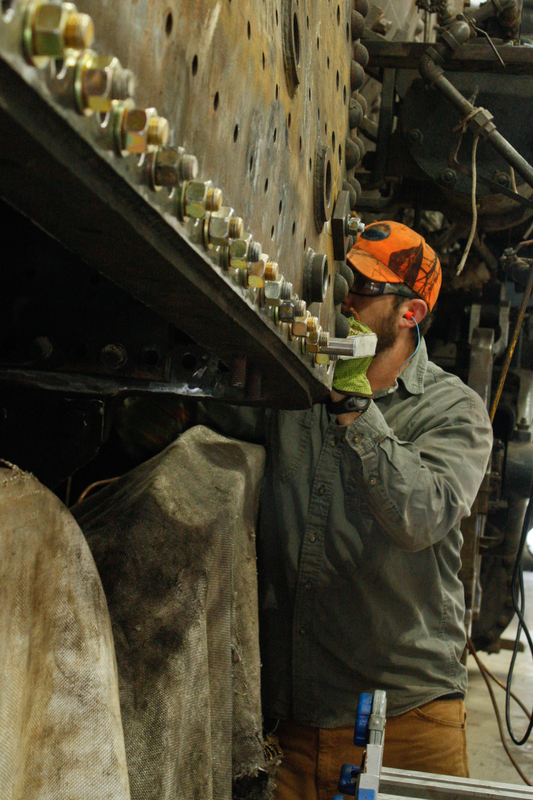 An important step each month in the caring for a steam locomotive is a boiler wash. Having a regularly scheduled boiler wash ensures that a locomotive boiler is free from all corrosion and scaling, which if left uncleaned could over time deteriorate the boiler and lead to damage. The first steps in a boiler wash are emptying the boiler and removing the brass washout plugs. 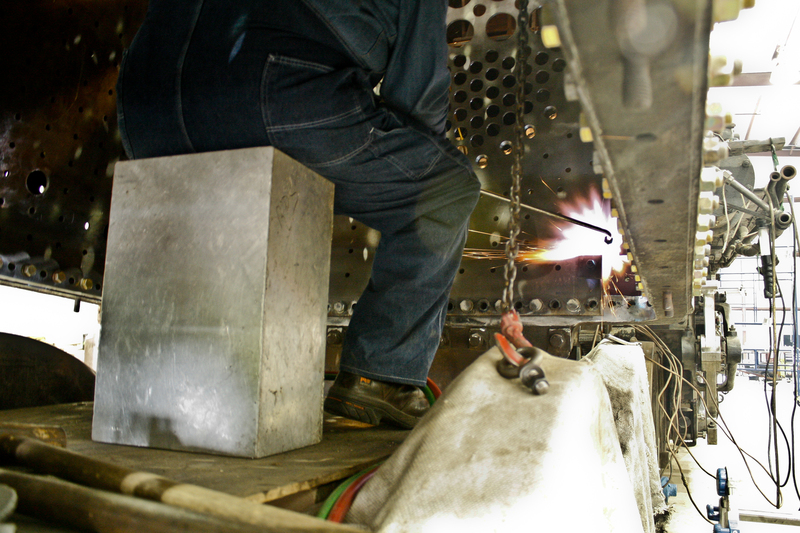 High-pressure water is then sprayed through special tools to clean the interior of the boiler and smokebox. It is not a clean job, but our steam guys love taking care of 1702. A new tool box was added to the front of the tender last week, this will help with in-cab-maintenance/repairs while the locomotive is in motion. 1702 is scheduled to run the Tuckasegee River Excursion on July 6th, come take a ride or stop by and say hello! Check out the steam schedule by clicking HERE! Moving the locomotive outside to be washed. Marshal washing out the top of the crown sheet in the firebox. 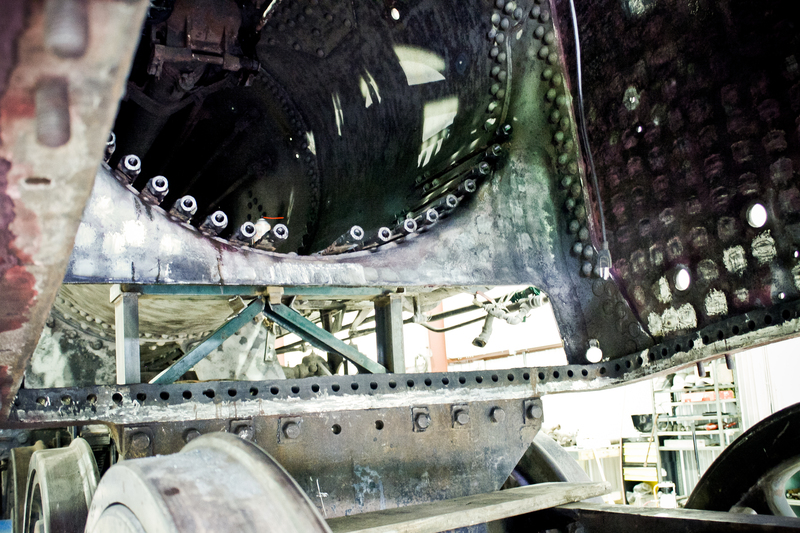 Marshal cleaning out the belly of the boiler barrel behind the front tube sheet. 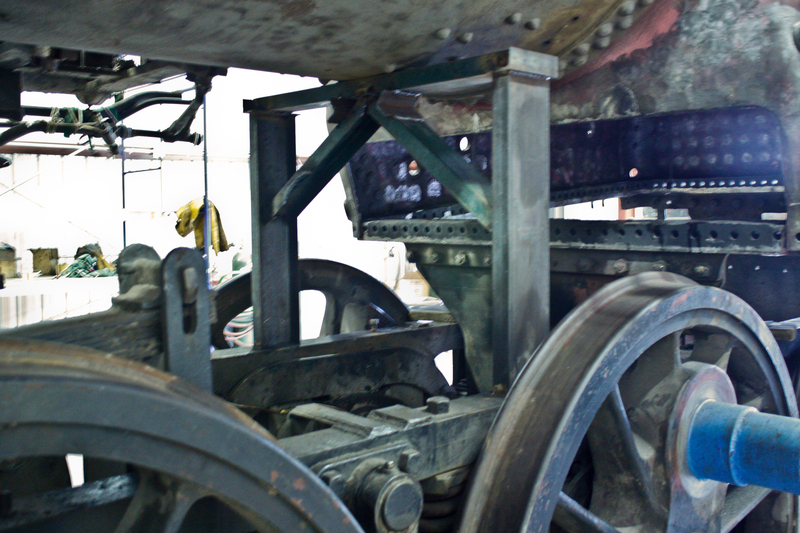 Marhsal after cleaning the interior of the firebox and rear tube sheet. Water draining out from behind the front tube sheet. Brian finishing up on the smokebox. The new toolbox on the front of the tender. Since the re-debut of #1702 we have made sure to take time and celebrate the return of this historical steam engine not only with our employees but our community as well. 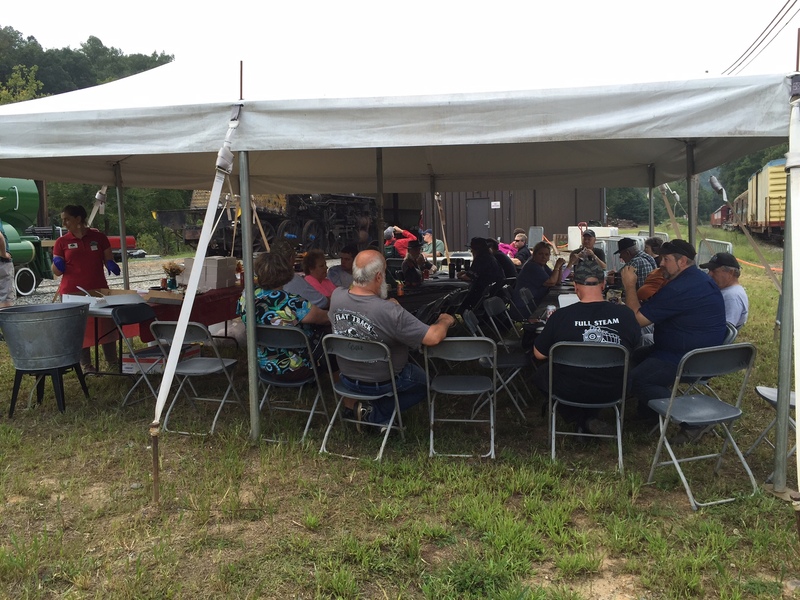 Because of the unique nature of GSMR’s public/private partnership with Swain County we indeed have a lot of fantastic supporters to celebrate with. Friday, Aug 5, GSMR celebrated the official debut of #1702 with a specialty ceremony and evening reception train. Our guests along with employees enjoyed a train ride with #1702 leading the way to the Fontana Trestle and back while dining on a fantastic spread of food prepared by our excellent Food and Beverage Staff. 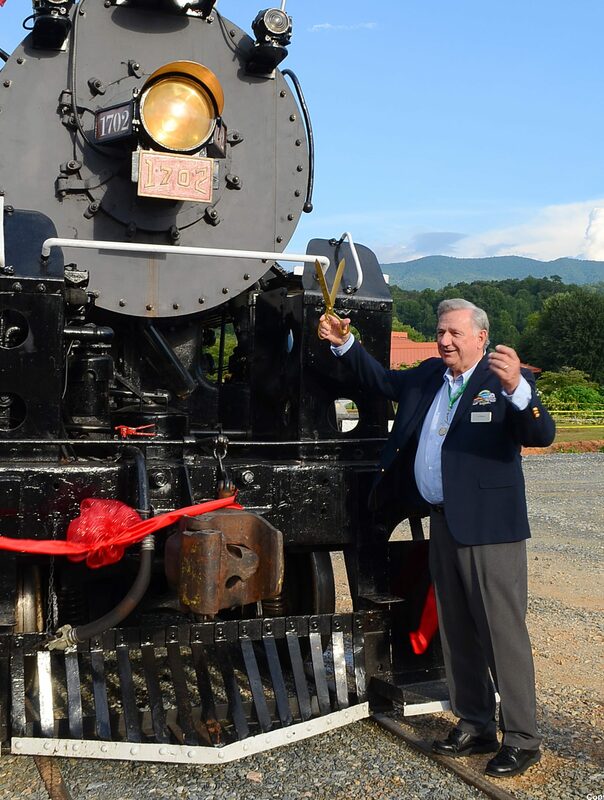 The evening began with a special ceremony in which our owners Al & Carol Harper recognized all the hard work and dedication of the steam engine restoration crew, turntable crew, and Swain County community leaders. Specialty plaques that will be placed inside the cab of #1702 and at the turntable were also unveiled. We made sure to grab some photos to share! See below, our restoration crew paused for a photo op with some of the Harper Family, GSMR General Manager and GSMR Superintendent of Operations. (Left to Right) John Campasino, Robert Franzen (Steam Services of America), Brian Brooks, Kim Albritton, Marshal Harris, Joe Stewart, Al Harper, Carol Harper, and John Harper. More of The Harper Family enjoying #1702! 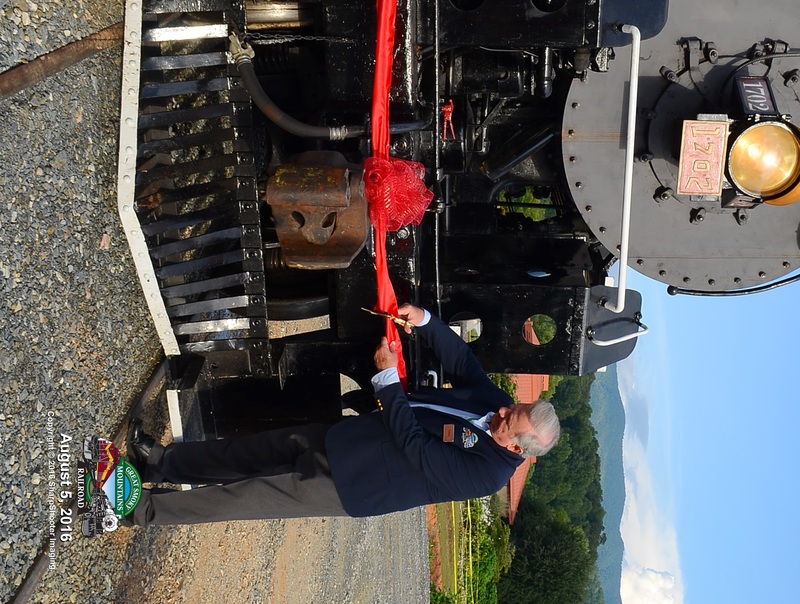 Mr. Harper cut the ribbon and officially christened #1702! The Steam of the Smokies has Returned! What a whirlwind last few months that we have had! So many parts have finally been placed together, welded, installed, or finished that it’s hard to recap! What we can finally celebrate is that #1702 is operational again, and that is a huge triumph for the restoration project. Our crew; Joe, Brian, and Marshal along with Robert Franzen of Steam Services of America have been in overdrive the past few months to make sure that we would fall as close to our debut date of July 22 as we could. 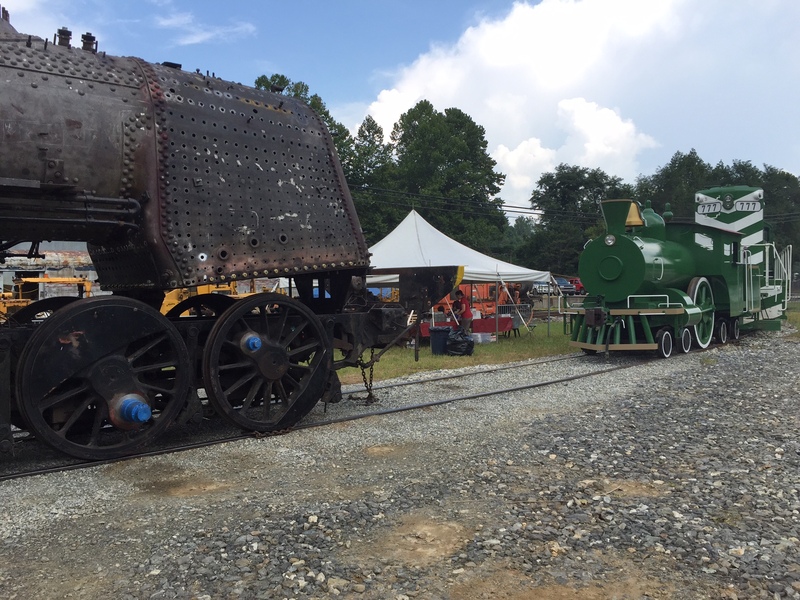 On July 21, #1702 took her first steps in the Dillsboro railyard 100% independently operational. After that successful mini trial it was decided that a test run would be performed the next morning from Dillsboro to Bryson City. About half way through the morning test run a mechanical issue with the wheel bearing overheating was discovered. This caused #1702 to be stopped immediately for repairs on the main line. Once stopped the crew removed the cellar box on the rear #4 driver and found that the brass bearing and axle was being damaged due to the lack of lubrication causing the bearing to heat up. Unfortunately the engine had to be returned to the shop in Dillsboro for further repairs upon this discovery. 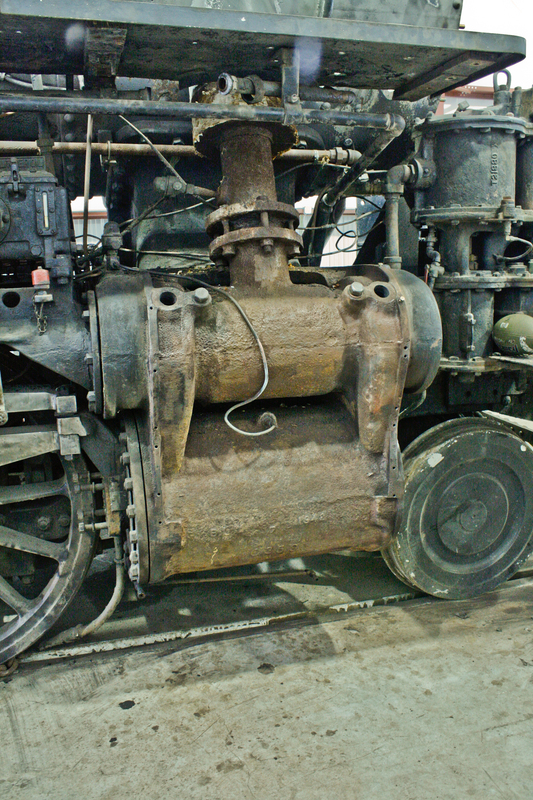 Fortunately, the damage to the brass bearing and axle was not that significant because the issue was found quickly by the GSMR Crew and Robert Franzen of Steam Services of America on the initial test run and the #4 driver did not have to be dropped out. The engine remained in Dillsboro for the next 48 hours, with the assistance from Steam Services of America our crew focused on the repair of the bearing and lubrication problems. While it was out for service they also inspected the oil lubrication system that provides oil to all bearing boxes to prevent future overheating problems. Other minor improvements included modifying the burner and adding a new fuel flow valve to improve the firing process. On Sunday July 24, another test run was completed successfully arriving to Bryson City with cheers and applause from spectators. 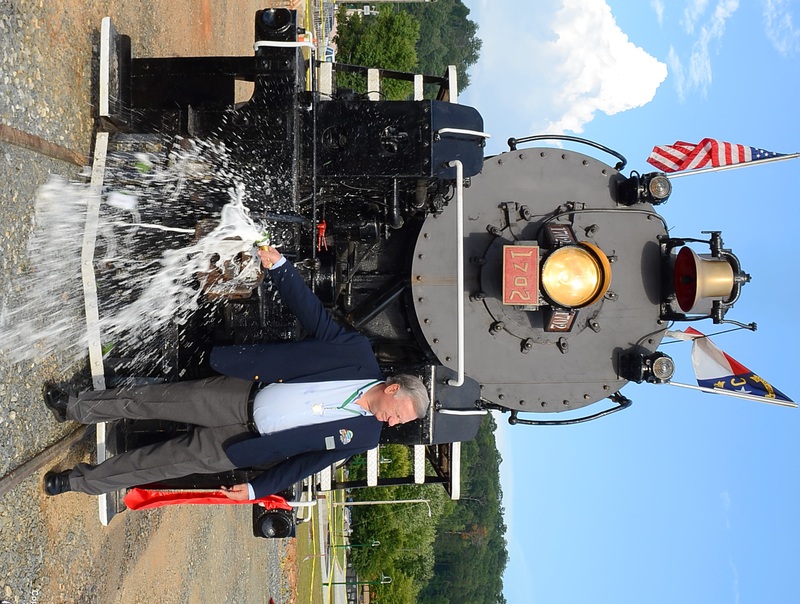 Tuesday July 26, the engine set out for its first successful passenger excursion on the Tuckasegee River run. Along the route rail fans waited at every crossing to take the opportunity to capture #1702 on her first journey. We have seen some great photos on the web, thanks to all who shared. After completing two successful Tuckasegee River Excursion trips, the crew prepared for the first Nantahala Gorge Excursion on Friday July 29. For its’ first run to the Gorge the train was sold out, full of excited passengers and fans. Everyone enjoyed finally hearing the sound of the steam engine and the whistle echoing between the beautiful scenery of the Smoky Mountains! Saturday evening a problem with the throttle opening and closing properly left the engine powerless. #1702 had to be taken back down to the steam shop in Dillsboro for a proper shut down and repair. Once shut down the crew inspected the throttle thoroughly and found that they could repair it by machining new parts to correct the operating malfunction. In order for the engine to have enough time to be fired up and ready to operate on Wednesday Aug 3, the Tuesday trip had to be changed to Diesel only. We appreciate all of the fans who have followed this journey and continue to stay passionate about this important restoration work. With such a historical piece of equipment we are looking forward to the continued work that it will require to stay in top shape! We hope to see you riding steam in 2016! Our last blog post featured a few videos of the flue tube instillation and we are happy to report that the boiler is ready for water and pressure (hydro static testing)! 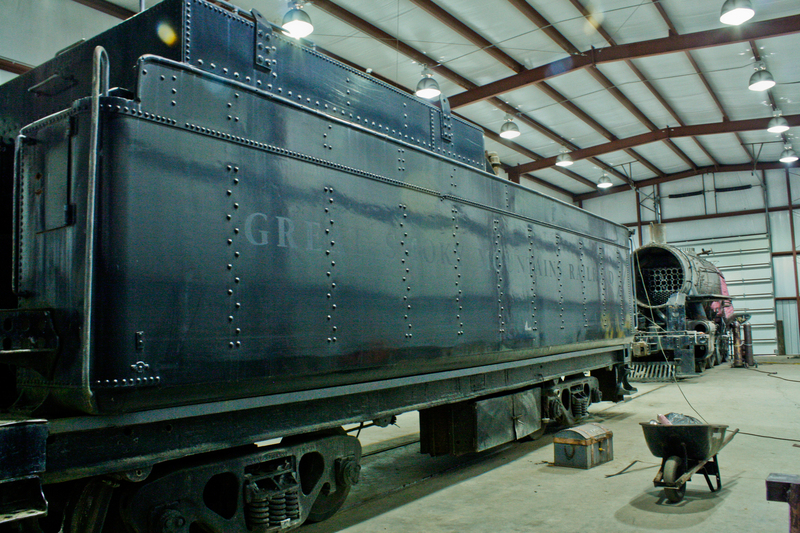 A huge step in our final months of completion before our scheduled return of #1702 this summer! 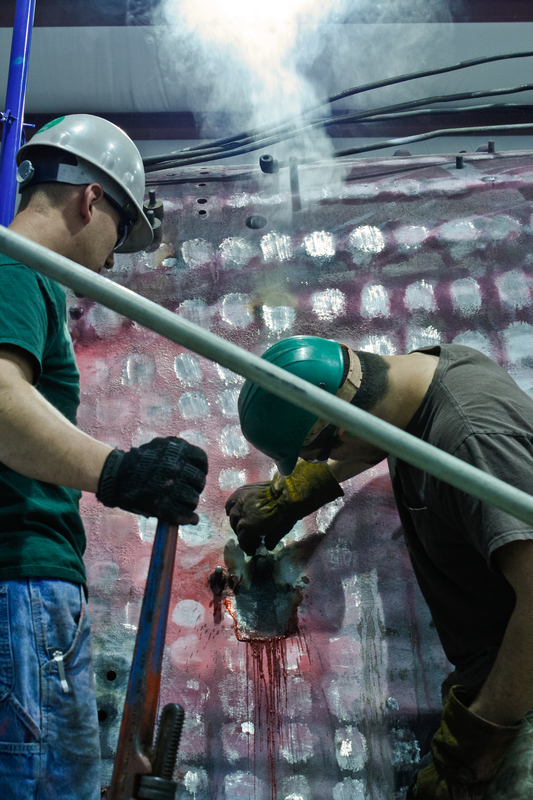 Since the completion the guys have been using compressed (120lbs per square inch) air to test the pressure inside the boiler. Steam Services of America contractor Bob, explained that by using soap and water they can easily locate where the leaks are allowing the air to escape, causing suds to appear. Once identified the leaks will be sealed. The next step is the hydro test which should be conducted sometime this week. After the test is completed a few minor additional items that the boiler needs can be installed and the boiler can be prepped for initial fire-up testing. 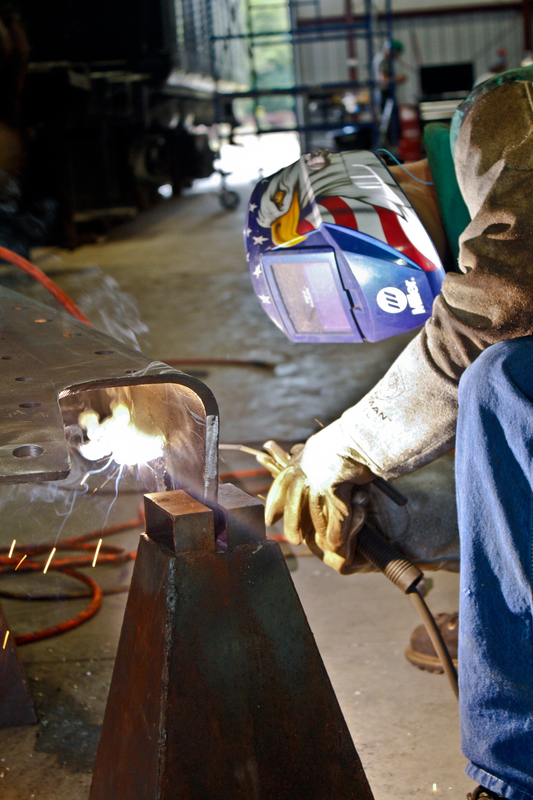 Last week Brian worked to complete the fabrication of the water column that will gauge the water level in the boiler. The engine was moved so that they could prepare to reposition the tender behind the engine. While preforming the first movement test they discovered a few needed repairs to the entrance track of the steam shop. Those will be repaired before the next move. While #1702 was outside the guys enjoyed giving it a much needed wash! You can certainly see a change in the firebox interior with the instillation of the tubes and flues and now the transverse arch tubes. These transverse arch tubes are the newest addition. Originally arch tubes were inside the firebox but this new transverse design will prove to be more efficient in circulating the water from the side sheets to the top crown sheet allowing the water to be heated faster and more efficiently. Steam Services of America also delivered the 30 New Sets Super Heater Units in March. The SH Units will be installed once the hydrostatic testing of the boiler is finished and the boiler is being prepped for fire-up. 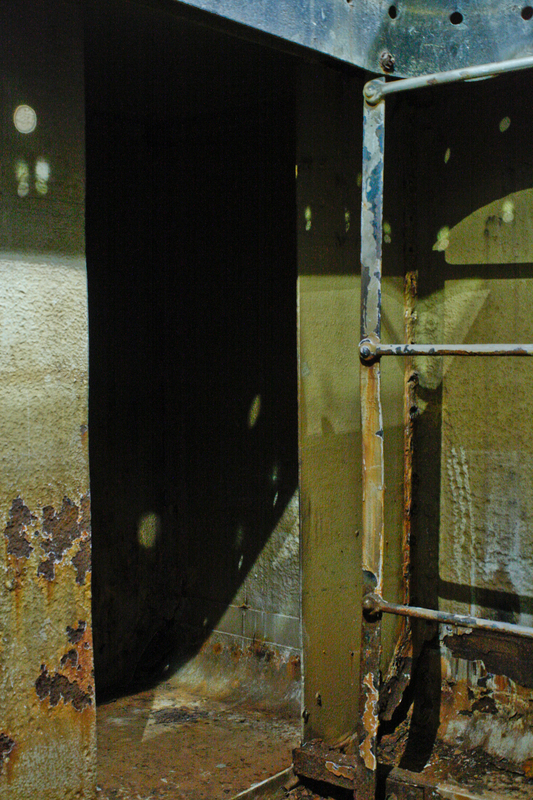 The SH Units which are installed in the smoke box and lay inside the flues inside the barrel of the boiler take the saturated steam generated in the boiler and reheat the steam through the SH Unit piping from the gases from the firebox which travel trough the super heater flues heating the steam inside the SH Units. The saturated steam is about 450 degrees Fahrenheit when taken out of the boiler and heated to approximately 650 degrees Fahrenheit after passing through the SH Units. Once the steam is superheated it then enters into the valves and pistons where the steam goes to work moving the engine drive wheels. Our anticipation is growing with the excitement of finally seeing #1702 back on the line! We hope that you have booked your ticket. If not, find all the information HERE. It’s official, #1702 will return to service this summer! Read the official press release from GSMR below, or view it on GSMR’s website here: http://bit.ly/1pvO1LD Tickets are on sale now! 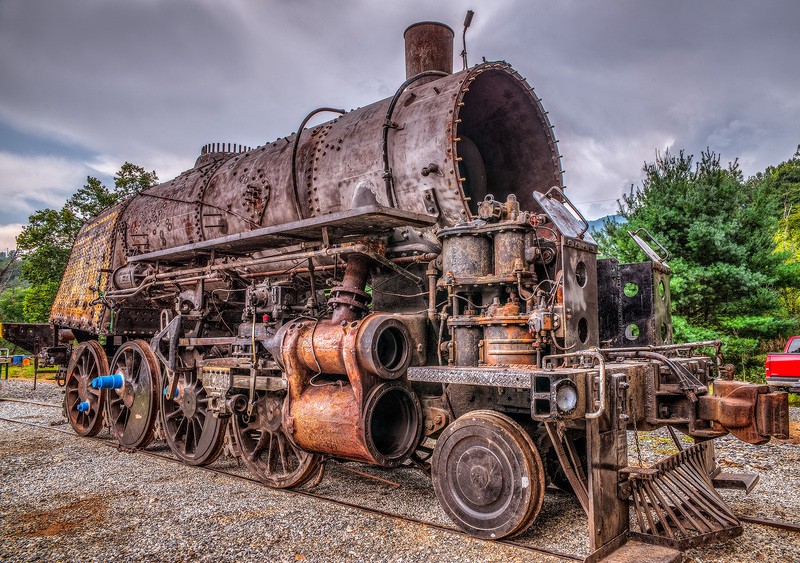 Bryson City, NC – After long awaited anticipation Great Smoky Mountains Railroad (GSMR) is excited to announce that the historic #1702 Steam Engine will return for the 2016 excursion season! 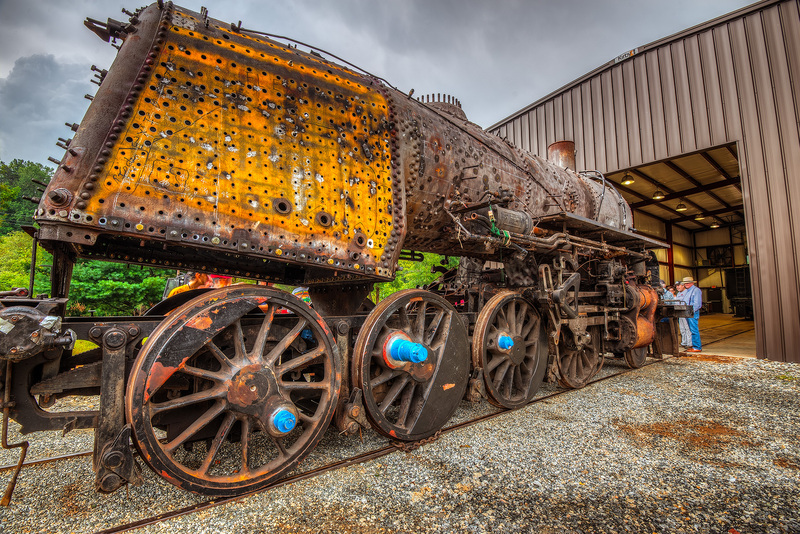 Thanks to the innovative private/public partnership between Swain County Commissioners, Tourism Development Authority Board, and GSMR, #1702 is revived and ready to roll on the rails! Booking is now available! Steam excursions will depart from the historic Bryson City Depot beginning July 22nd with a variety of options. Throughout the season 39 excursions will follow the Nantahala Gorge route and 22 excursions will follow the Tuckasegee River route. All general excursions will offer the full variety of seating options including our most popular First Class seating. Before departure, passengers may arrive early to enjoy a meet and greet with one of GSMR’s star conductors along with the engine crew. As it prepares for its journey, #1702 will be on display allowing for photos opportunities and an up close and personal view of the impressive equipment. On board, passengers will enjoy interacting with staff and hearing about various historical points and interesting facts about #1702. All steam excursion passengers will receive a commemorative #1702 souvenir ticket and lapel pin to celebrate the locomotive’s return to the rails! These items are one of a kind and not sold in our retail store. 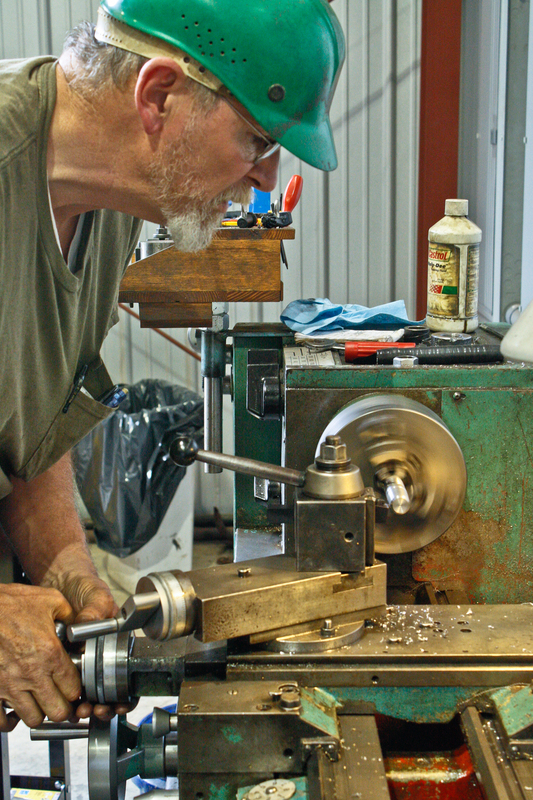 Upon return to Bryson City, a live demonstration of the turn-table will also be on exhibit. 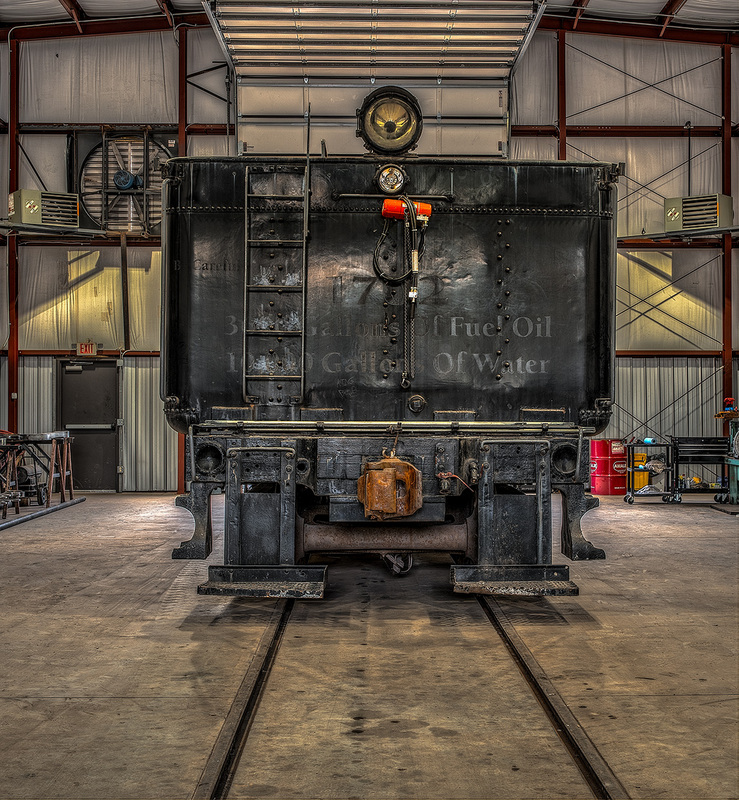 A few lucky guests will be selected each day to be an active participant in the manual turning of the locomotive! In addition to the regular excursion schedule, #1702 will also be leading six special event trains. The popular, family friendly Fontana Trestle Train featuring BBQ & Brews service and THE POLAR EXPRESS train ride will be operating with the steam engine on select dates! #1702 will also pull two new event trains in 2016: the Railroad Reserve, a wine and rail pairing dinner train; and the Photo Special, an 8-hour roundtrip excursion to the Nantahala Gorge departing from Dillsboro NC, stopping for two run by photo opportunities and a short steam shop tour. Booking is now available for the variety of steam powered options. Pricing and details can be found at http://www.gsmr.com or by calling 1-800-872-4681. Exciting news from the steam shop! After months and months of work the FINAL STAYBOLT was completed! The last of the 1,175 staybolt was finished this past Tuesday and the guys were certainly excited to check that task off the list! Here are some videos courtesy of Brian and Marshall. There has been great progress with the tender. The inside has been cleaned and prepped for paint. The air and steam gauges have been sent off to be calibrated, and it will be prepped for a new wheel set. Pressure testing was completed and it passed with no leaks! Say hello to Tony and Eli! These guys have been working on the compressor. 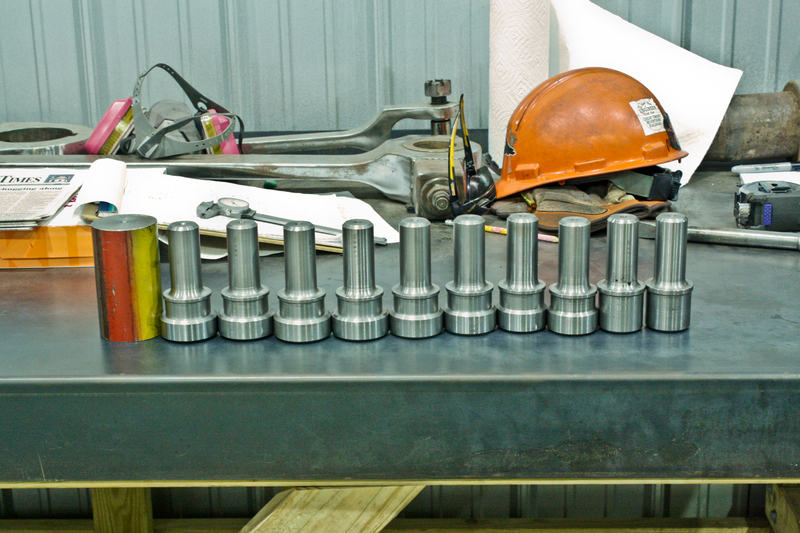 It has been stripped and the cylinders have been honed. They are checking the gauges in the compressor to make sure they are still round. The valves have been measure determined the clearances. The tubes and flues were delivered from Germany. Next expected to be delivered are the ferrules, which are the copper rings that are placed around the tubes and flues to seal. Also arrived are the new injectors. The power reverse has been removed for cleaning and it was tested last week – it’s good to go! The shop received a flue roller from our sister railroad D&SNGRR. This will be used to install the flues, which should begin next month! Buddy has begun working on the cab carpentry. New beadboard will be replaced throughout the interior. The exterior has received some deserved attention. A lot of the rough patches and holes are being filled in, welded or bonded over to create a new fresh and smooth surface. Our last exciting arrivals are the builder plates! These are casts of the original plates, and will be one of the final pieces placed on the engine before it’s set to return to the rails! A great big thank you to all who joined us for the Steam Shop Tour during RailFest weekend! It was such a great success, with many out of state guests joining us along with locals, whose excitement was only fueled by the chance to see the progress. #1702 was on full display along with, the steam shop, #777 diesel engine, and if you notice, a small replica engine that we repainted and displayed just in time! 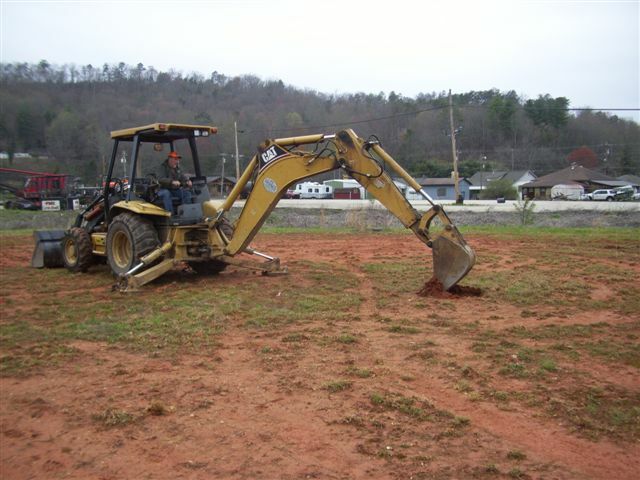 This little green guy will be placed in Bryson City beside our historic depot and will be a great photo op! Here are a few fantastic captures of the engine. Photographer Charles Hardin was kind enough to share these great images. Enjoy! The shop guys were happy to host everyone for the afternoon, and really enthused by all the questions everyone had. After a nice holiday weekend they were back at it! The biggest project has been fitting the interior sheets in the boiler. All but one sheet has been placed inside and the contractors have been working to get them set. A door sheet had to be removed so it could be realigned. New bolts for the steam pipe on both sides have been installed! 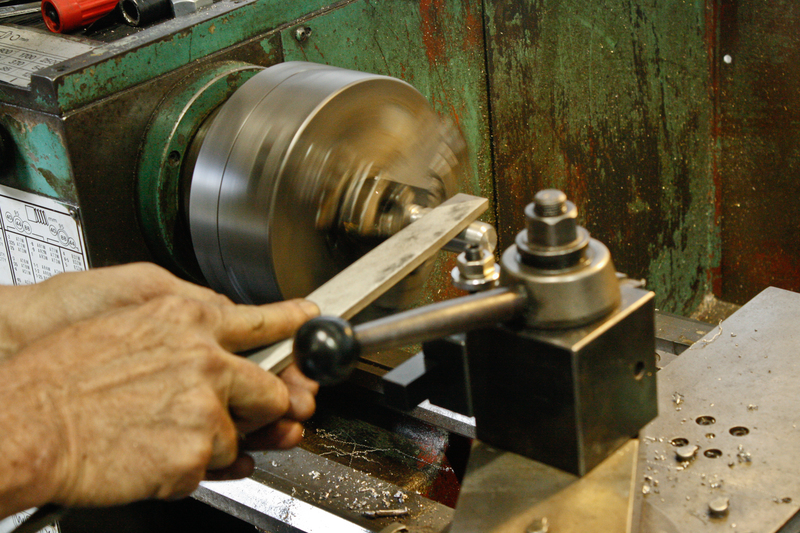 Joe has been working on the lathe making some much needed tools. All the belly brace bolts are completed, and he just finished up on a new welding fixture for the flexible staybolt sleeves. 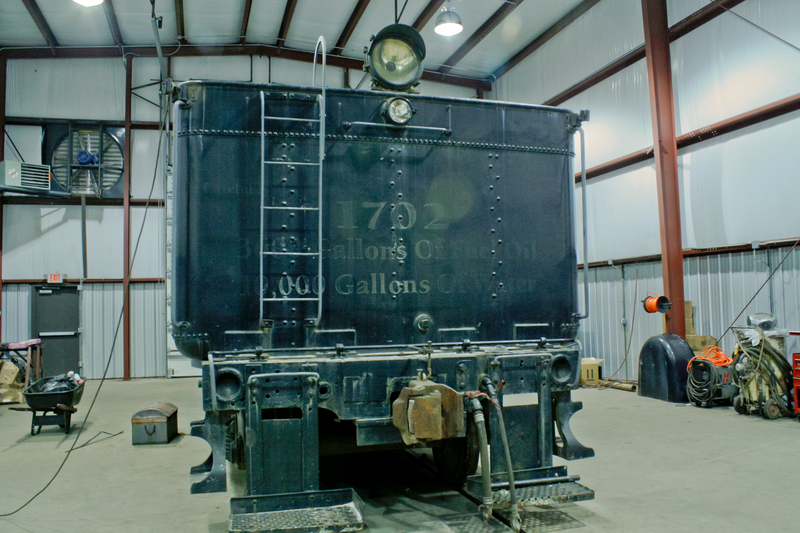 After several months of deliberation, we are happy to announce that Robert Franzen, owner of Steam Services of America, has been selected as the official contractor for the boiler rebuild of #1702. 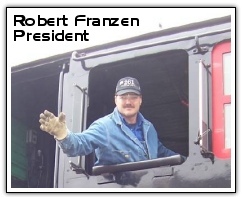 Franzen is also currently working on a steam engine rebuild, similar to that of #1702, in Alaska. During the boiler rebuild he will be joining the team a few days a week in the shop, as he is going between two projects. The first order of Franzen’s work began this week as Bob Gold, was brought in to aid the placement of the new stay bolt holes. 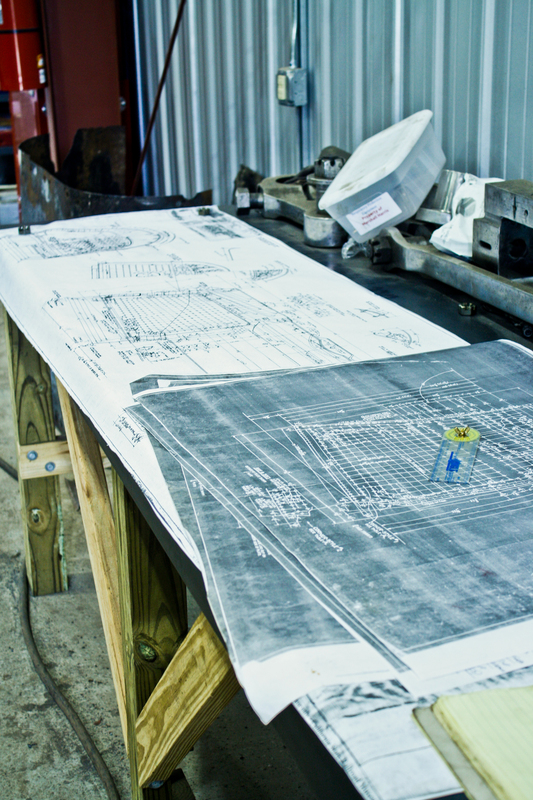 Original layouts of #1702 are being used as the reference point to which the new holes will be placed. 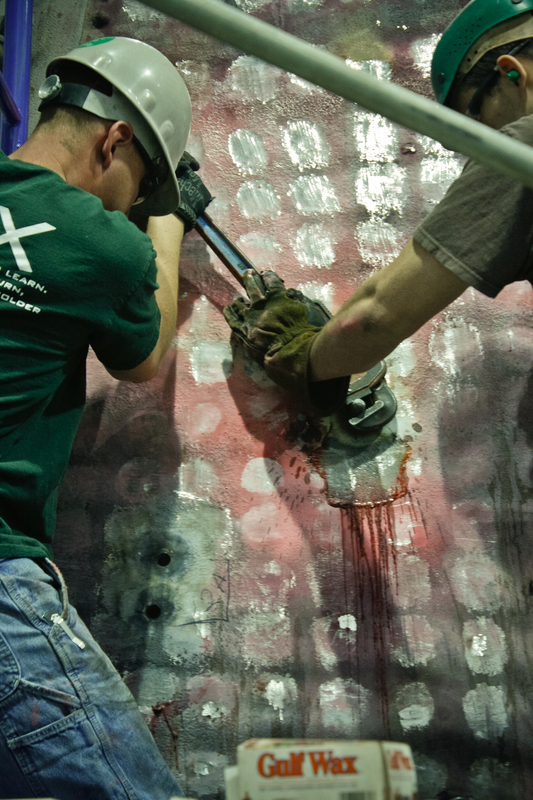 Marshall has been cleaning the dirt and removing the pink die used in the crack tests. 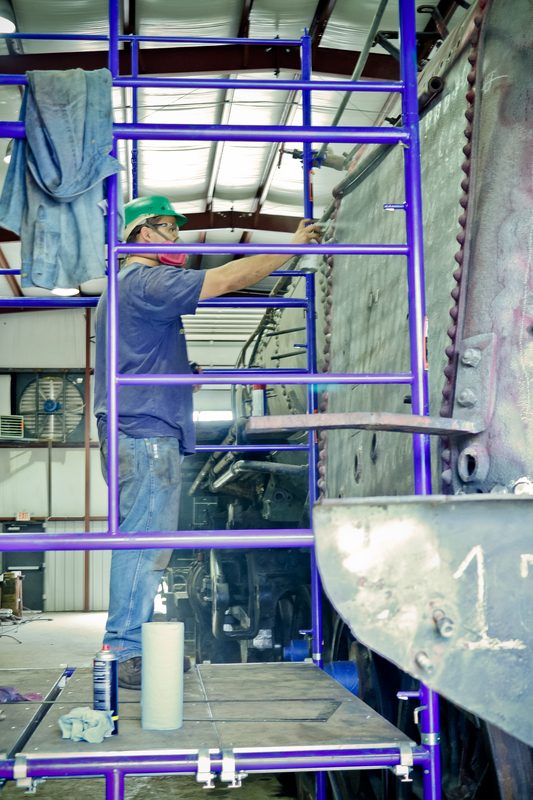 He has also spray painted the surface with a temporary gray in order for the fresh marks to be visible when applied. A few reference markings have already determined that on both sides the blowout valve will be moved from its former position to allow the boiler wash to operate more easily than before. 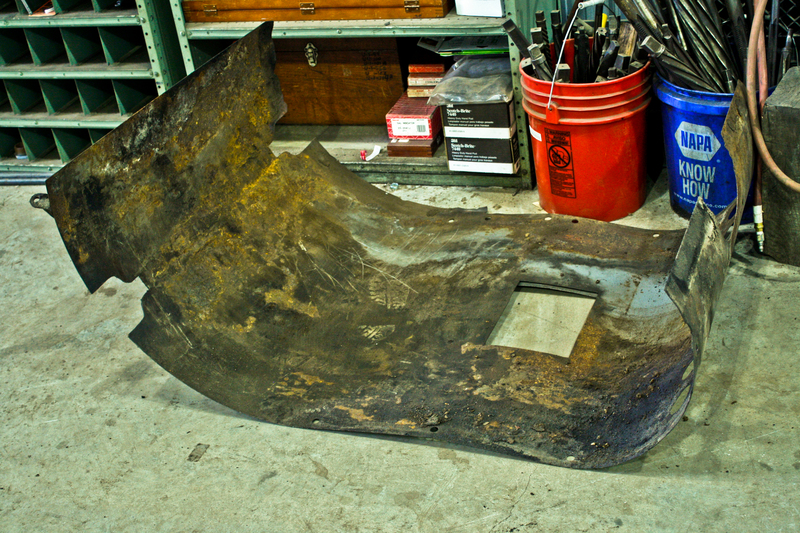 A section of the outer throat sheet that revealed cracks earlier, was removed and a new sheet has been cut (roughly 3 quarters of an inch steel). The piece has now been sent off so that a special 8 degree bend could be formed to allow the fit to be exact. In order for the guys to get a good handle on the section that was cut, they removed the air tank which opened up plenty of room for access. In the air tanks absence the guys constructed a brace to support the boiler so that it wouldn’t sag. Brian finished up his dirty job of removing the cylinder valve covers and the insulation was cleaned out. The cylinders themselves need more work, but they have been cleaned as much as possible for the time being. 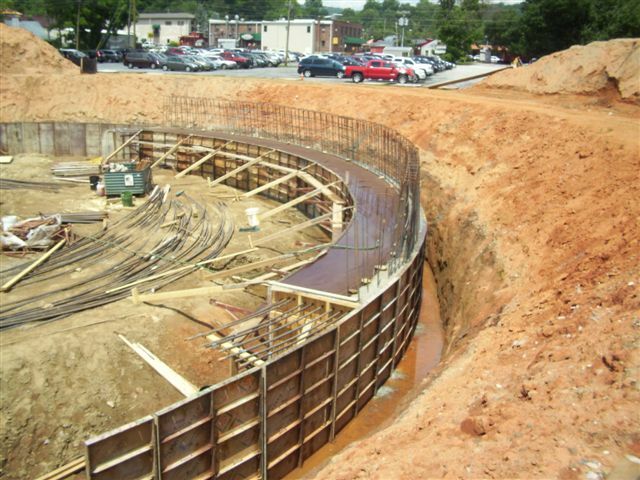 A pivotal point was passed in the turntable build this week by completing the building of the forms and re-bar and then successfully pouring 47 cubic yards of concrete for the first quarter of the lower ring wall. The force of 47-yards of concrete pushing against the forms and bulkheads was tremendous, but everything held tight and the pour was a complete success. In order for the concrete to cure slowly and properly, we must wait five days before the forms can be removed. To aid the concrete in hardening properly, we assembled a watering system using a pump in the nearby creek and a series of garden hoses. Water is continuously flowing over a blanket of burlap keeping the concrete from drying out, overheating and curing too quickly. 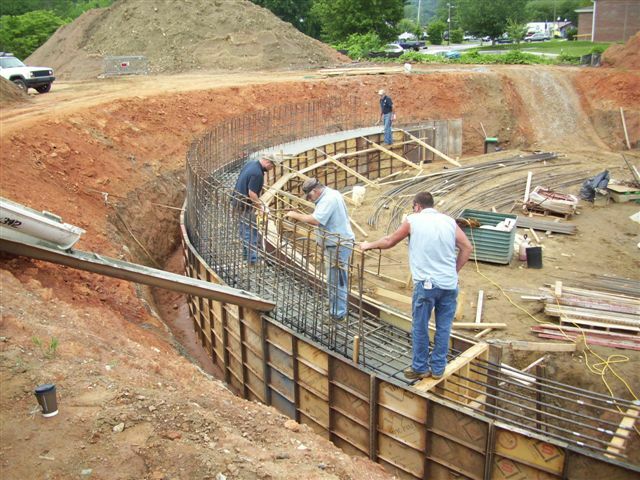 We have already begun assembling the re-bar for the second 1/4 of lower ring wall pour and we will also start assembling the forms for the upper ring wall pour on the first 1/4. Another monumental mark was reached in the past weeks, when the large bearing assembly that the turntable pivots on was set and secured! 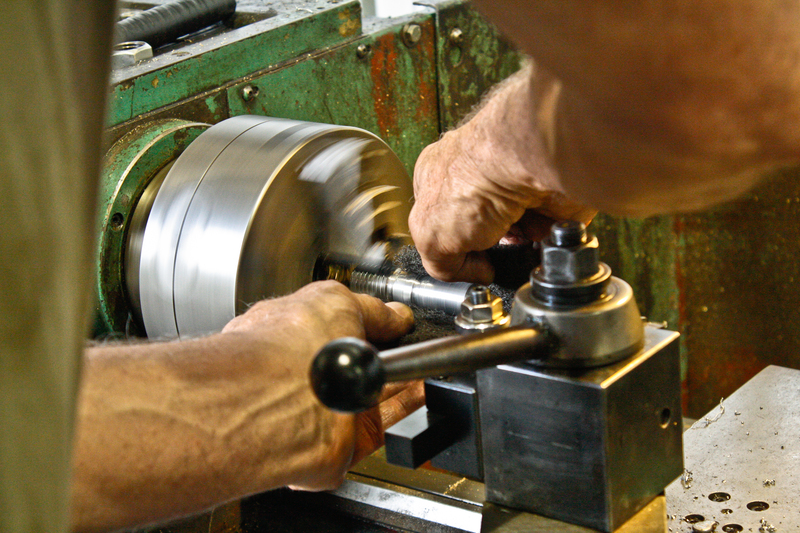 The installation of this pivot bearing means that the center pivot pedestal build is complete and able to support the entire weight of the turntable and any locomotive placed on it. The bearing assembly install could not have gone any better! The steam shop guys have been busy this month and couldn’t be happier about the warmer/milder weather that has finally reached the Smokey Mountains. The tender has been moved inside the shop and the cleaning has begun. Tim, one of our GSMR Operations crew members, has been recruited to help with Tender duties. 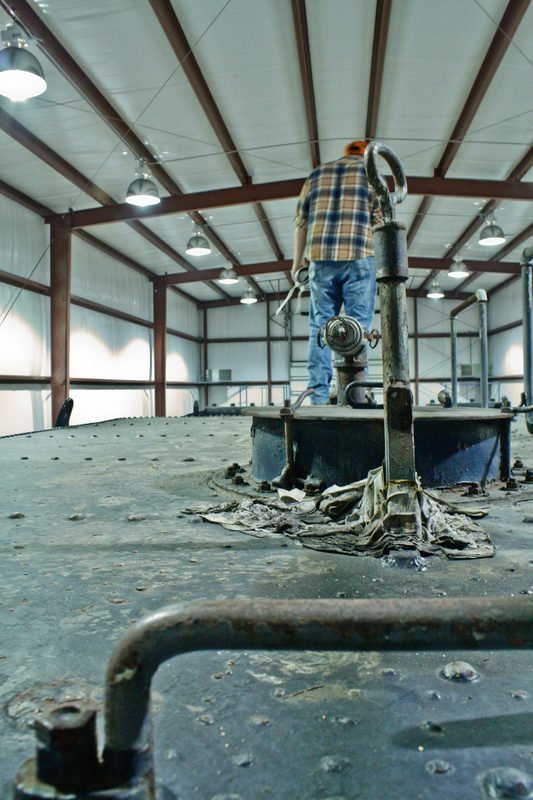 He has been removing the old epoxy that has been inside the tender for several years along with prepping for the new marine grade epoxy that will be applied. 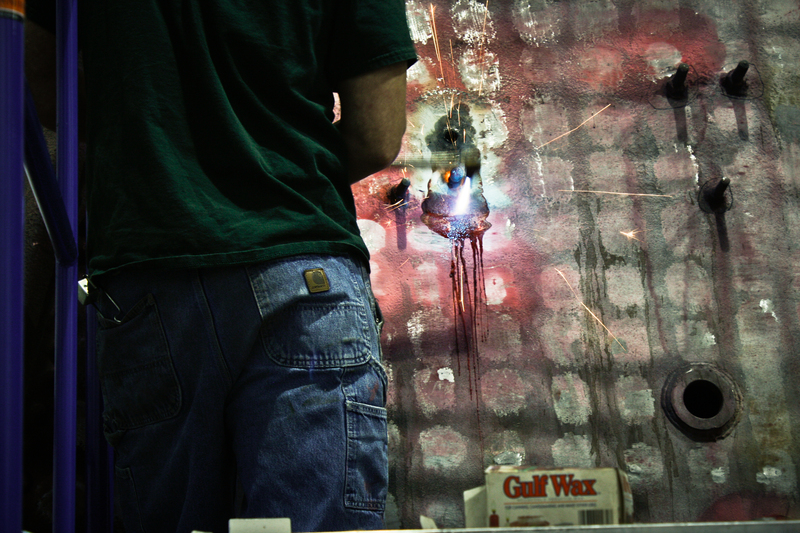 This past week Brian and Marshal have been pulling the studs off the firebox and wrapper sheet. 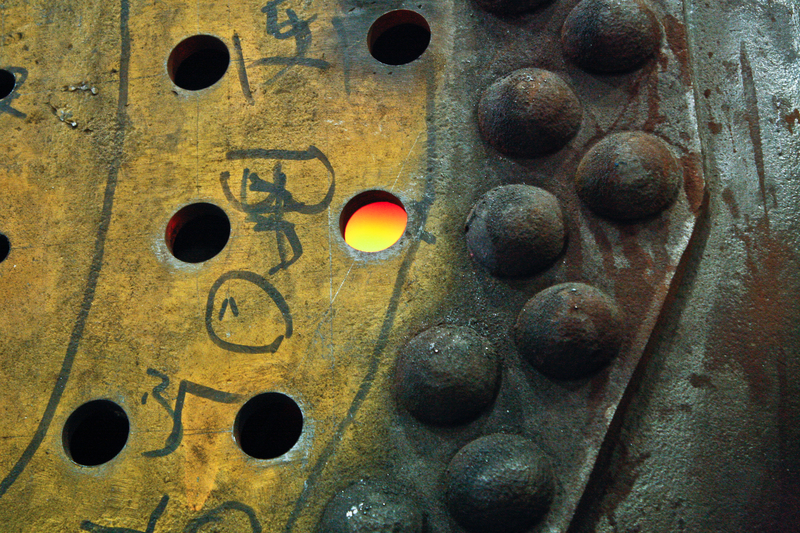 The old rivets were shot out a few weeks ago! Stay tuned, there may be video footage of the rivet removal coming! 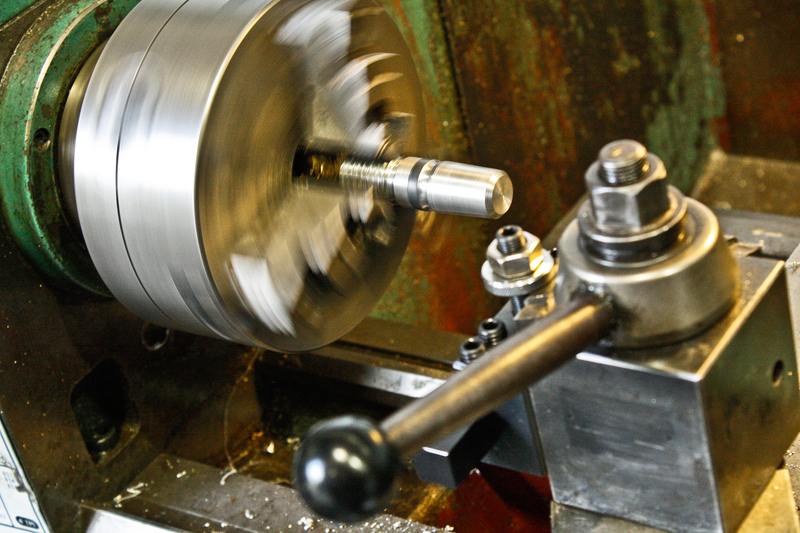 Joe has been working on the engine lathe making new rivet snaps. They are ready for heat treatment and then the next step of re-reviting the mud ring. 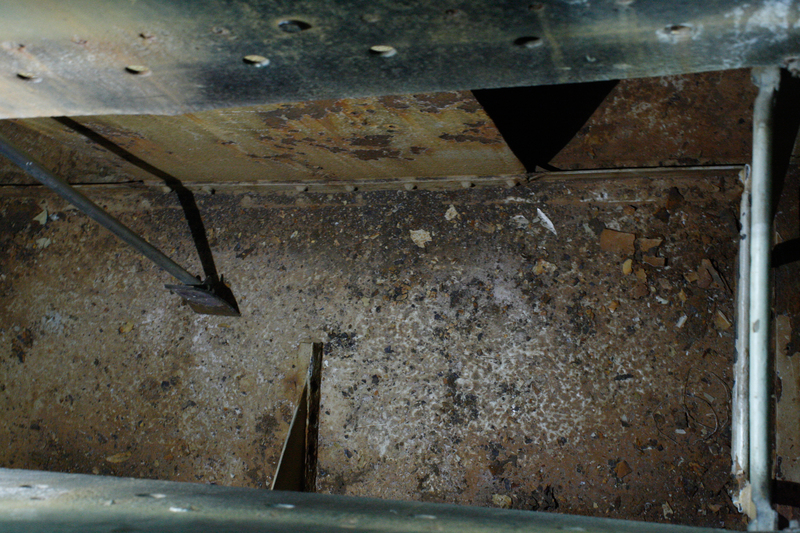 The remainder of the old firebox sheet has been removed and the mud ring inside was welded and grounded down. Great news! The crack check was completed on the wrapper sheet and everything passed. 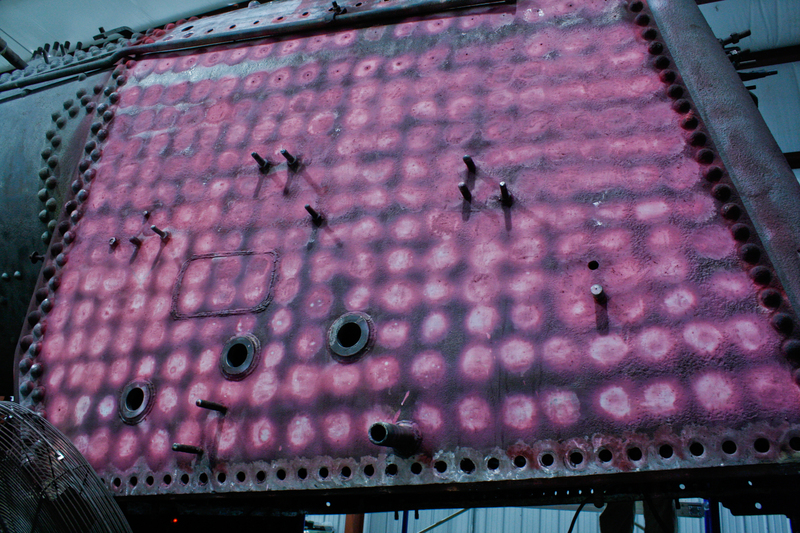 There were a few minor repairs that the developer revealed when it was applied to the penetrant (the pink dye). Things will be kicking up here in Bryson City as well! 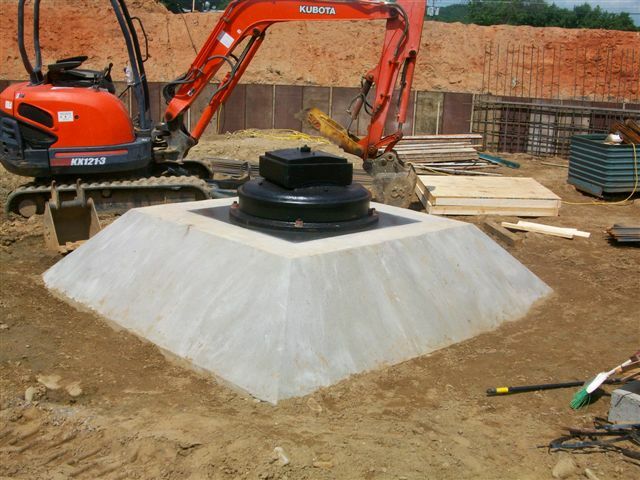 On Monday April 6 – crews officially broke ground for the instillation of the Turn Table! The heavy work will begin this coming Thursday when the pile driving begins. Stay tuned for photos and the latest information on that!